Over the past few weeks, my wife and I have begun seriously shopping for a replacement for my truck. There are two big reasons for this: first, my truck has a long shopping list of repairs that need to be done to it in the next six to twelve months, bills totaling about $5,000 according to two estimates; and second, we’re concerned about seating capacity for our whole family since we’re hoping for a third child in the next year or two (and my truck is already very cramped just with the four of us – yes, it’s possible right now, but very uncomfortable). This isn’t a burning need. I don’t commute, so on the occasions when I do need a vehicle, I still use the truck for short trips to the library or the grocery store. Other than that, we use our car for everything. In short, this situation is making it possible for us to research the exact car we want and wait patiently to find it at the right price – the most cost-effective way to car shop. Our biggest factors for purchasing a vehicle are interior space so our whole family can sit comfortably (including a potential third child), high reliability numbers from the manufacturer, a strong safety rating, and fuel efficiency. We don’t care that much about the glossy touches – I don’t really need a GPS in the dash, thank you. One of our big challenges has been determining how much each of these factors is worth for us. With the reliability, safety rating, and comfortable seating, it’s hard to put a specific number on these issues – they’re more of a basic requirement before we’d consider purchasing a vehicle. Fuel efficiency, however, is another matter entirely. You can actually do some raw number crunching and see how much fuel efficiency is worth for you. So let’s dig in. Let’s assume that we’re looking at two more or less identical vehicles in terms of safety, reliability, and comfortable seating – we’ll use the 2008 Toyota Highlander and Toyota Highlander Hybrid for this example. The reason for this is so that we can get some real-world numbers to work with instead of hypotheticals. According to MPG-O-Matic, the normal 2008 Highlander gets 17 city and 23 highway, while the hybrid gets 27 city and 25 highway. So let’s walk through some of the basic premises here. First, how much do we drive in the city versus on the open road? We drive about a 50/50 split. Most of our day to day driving would be considered mostly city driving, but we occasionally go on three or four hour trips to visit family and those are mostly highway. You may be in a different situation, of course, with a higher portion of city driving. For us, though, that gives us an average of 20 miles per gallon for the normal version and 26 miles per gallon for the hybrid version. Second, how many miles do we expect to put on the car? This is a question you should ask yourself before any car purchase. 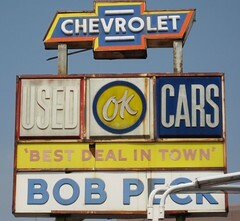 We intend to buy a late model used car with as few miles as possible on it and drive it until it starts breaking down. So, we would estimate 130,000 miles – an average of about 13,000 miles a year for ten years. Again, you may have a different assumption here – I’m just walking through my own assumptions for my family. Third, where will gas prices go in the future? I expect an average of $5 per gallon of gas over the next ten years. Right now, it’s lower than that, but I expect gas prices to go up over the next decade quite a bit. Over a shorter term, I would estimate a lower price – maybe $4.50. So how much will I be spending on gas in each model? For the normal Highlander, I’ll drive it 130,000 miles at 20 miles per gallon, paying $5 per gallon of gas. I just divide the miles I’ll drive it – 130,000 miles – by the miles per gallon (20) to get the number of gallons I’ll use over the life of the car – 6,500. At $5 a gallon, I’ll be spending $32,500 on gas for this model over its lifetime. For the hybrid Highlander, I’ll do the same – 130,000 miles, but at 26 miles per gallon, and $5 per gallon per gas gives me a total cost of $25,000 for gas over the lifetime of the car. Thus, the improvement of fuel efficiency in the hybrid is worth about $7,500 over the lifetime. I wouldn’t quite value it that high, since dollars today are worth more than they will be later on, but it’s a good thumbnail to work with. But is that $7,500 enough? Edmunds estimates the value of a 2008 Highlander Hybrid at $31,687 to $37,363. Meanwhile, a normal 2008 Highlander goes in a range of $22,726 to $28,290. The difference? Almost exactly $9,000. In this case, the extra fuel efficiency isn’t worth the higher price (unless you believe gas will completely skyrocket way past $5 per gallon soon). You can use almost the exact same calculation to compare any two similar cars. Let’s say I wanted to compare that 2008 Toyota Highlander to a 2008 Honda Pilot, which Edmunds prices at $23,476 to $30,736. The difference in prices would be about $1,000 with the Pilot being more expensive, but MPG-O-Matic reports a 22/16 split – meaning it’s a mile per gallon worse than the Highlander. For our purposes, the Highlander would be a better buy than both the 2008 Honda Pilot and the 2008 Highlander Hybrid. Remember, though, gas mileage is only one factor in your calculations. You should determine what factors are important to you before beginning your search and make sure you’re selecting a vehicle that meets those qualifications. At a minimum for everyone, I’d look for a minimum level of reliability and then focus on the best fuel efficiency you can get for the buck. First, figure out what criteria are important to you. I encourage you to consider good reliability as a minimum requirement and also use fuel efficiency as another. Beyond that, make sure it fits your needs – and your family’s needs. If I were single, for instance, I’d probably just get a tiny, very reliable small car with strong fuel efficiency, as those are the only factors I would really care strongly about. Second, filter through all cars based on those criteria. Identify as many models you can that meet your minimum needs. I would stick to brands that have a history of reliability (information you can easily find from auto magazines and Consumer Reports), but after that, it’s really a filter based on what you need. For us, we’re looking strongly at a van or SUV, simply because of the potential of three children. Third, get prices and fuel efficiency numbers on those models. Sites like MPG-O-Matic and Edmunds are great sources for numeric data. You may also want to cruise a few local dealerships and get some idea of their asking prices (recognizing that they’re negotiable to an extent) and also get an idea of the value of your trade-in and of your down payment. Once you have that, start crunching numbers and find the vehicle that’s the best value for you. We’re still in this process, but as you’ve seen above, the Highlander is definitely in the running (though we’re looking more at 2006 and 2007 models – late model used). Good luck!